Did you know that there is the Conch Republic at all? A self realised stand alone government, with prime ministers, a secretary general, navy, air force and army all ready and waiting? And most importantly this superpower, matching Russia, China and all the great forces of the world is to be found right at the bottom of the Florida Keys. Yes right down at the Southernmost point in Key West. Now you may think of Key West as just a small dot at the bottom of the map of America. A place for drinking, fun, artistry, and of course gorgeous weather, but it is so much more than that. The Conch Republic as it is also known, for a brief moment in time, battled against the United States of America with all their might. Battling against perceived wrongs in order to secede from the rest of the States, and set up their own republic. For the briefest of time on April 23rd 1982, the cameras of the world were turned towards the Southernmost point of America, to see who would win. 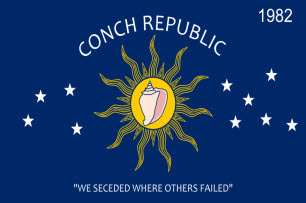 Of course in true terms the Conch Republic never truly came to fruition, and their dream was never truly realised, other than in a symbolic way. But what pushed these generally mild and contented people to crack and fight back. Read on my dear readers, as the story of the Conch Republic is one waiting to be told. Back in 1981 the Florida Keys were a happy place, and the thought of separating and establishing themselves as a Republic was not a thing that anyone would have considered. They had their beaches, the weather, and a relaxed way of life that for many was the cause for great envy. However they had a problem. And this was one problem, that they had never really gotten away from. Because of the way that the Islands hang like a necklace of pearls between the Gulf Of Mexico and the Atlantic Ocean, road and transport networks were very scarce. When you have water surrounding you on all sides there is only one way that you can build a bridge, and that is across as much of the 127 miles of land as you can find. And that is what they did, as first Henry Flagler looked to build his Overseas Railroad Company, to link up the Keys with the rest of America, and then after the great Hurricane of 1935, the Overseas Highway or also known as US1. So for all that time, and still to the current day there was only one way on and one way off the Florida Keys and that was this route. You put up with it, but it wasn’t ideal. And even after much improvement, if truth be told it still isn’t that brilliant. But still prone to traffic jams, delays, and inconvenience for all those using it on a daily basis. So you can imagine when in 1982, the United States Border Patrol, decided in their wisdom to start stopping all traffic just north of where the Monroe County Road 905A /Miami-Dade County Road 905A goes into US 1 to search for drugs and stuff, it wasn’t a popular decision. Ironically, I don’t know if this was just a fluke or something that the Government and US border people thought was amusing, but they decided that the road block was to be set smack bang in front of the Last Chance Saloon, slightly outside Florida City. The soon to be rising Conch Republic did not see the funny side and were not a happy bunch. Why should they as American Citizens accept being asked to show their passports as they journeyed around the state? Why should they allow tourism to the area, that a lot of the folks relied on, be damaged by this heavy handed approach to things? In a word they wouldn't and the Conch Republic started to gain many supporters, who felt that they would be better off separating from America. They even took their unrest to the courts and tried to get them to bring the roadblock down using official routes. But alas, the Conch Republic’s sympathisers complaints, which they had directed to the Government all fell on death ears. And the courts weren’t any good for their protests either. So Dennis Wardlow, who was then the Mayor felt that they had no choice but to pull away and start up on their own. And the first steps to legalising the Conch Republic was now officially on its way. Wardlow himself went on national television and declared immediately after the failed appearance in court "Tomorrow at noon the Florida Keys will secede from the Union!" It was all very dramatic stuff. At noon (yes, people always seem to aim for noon for the big stuff) on the day of secession, the crowds had started to gather at Mallory Square in Key West. Nowadays people are more likely to gather there for the Sunset Celebration that occurs at the Key West waterfront every night, but today the press, the dignitaries and of course the people of Key West were there to see history be made. And history was made, in a typical Key West style. I'm not sure why this symbolic statement was made, but the Conch Republic's Civil Rebellion began by breaking a stale loaf of Cuban bread over the head of a man dressed in a US Navy uniform. All hell then broke lose. The rebellion lasted about a minute, and then Mayor Wardlow who had this time decided he was to be named Prime Minister, turned to the Admiral in charge of the Navy Base at Key West, and surrendered to the Union Forces. He then demanded one billion dollars in foreign aid and War Relief to rebuild the nation after the long Federal siege! Yeah, you claim a lot of cash after a minute of civil unrest. You have to try your best to get cash out of the Government I suppose. Further Unrest....Yes This Is True Too! Although for many outsiders the story told above might seems a bit far fetched, but I promise you every word is true. The same can be said for the further invasion of Key West that occurred on September 20th 1995, when the 478th Civil Affairs Battalion of the United States Reserve wanted to practice repelling invaders to the United States. I guess they could have done this anywhere, but instead decided they they would land on Key West, and pretend that the lands were foreign. They made one terrible, devastating mistake. They didn't ask the permission of the Conch Republic to undertake these activities on their shores. So the Mayor/Prime Minister (seeking to gain some more publicity) grouped together his forces, and with loaves of stale Cuban bread which they used as missiles, and water cannons fought of the invaders. The next day, amazingly the newly founded Republic received an apology from the 478th Battalion stating "In no way did we mean to challenge or impugn the sovereignty of the Conch Republic"
They submitted to a surrender ceremony on September 22nd 1995. So Why The Name The Conch Republic Then? The name the Conch Republic was chosen as a symbol of the whole Florida Keys and not just Key West. The Conch is a underwater sea mollusc that is resident to the Florida Keys and the Caribbean, and is illegal to remove from the waters. So a small creature that would not be taken from its rightful place, seemed to be the obvious choice for the event. Each year at the end of April a series of events are undertaken to celebrate this slightly strange event that happened over 30 years ago. From drag racing, to parties, to music, to general good humoured fun, there are events happening every day. And certainly when all is said and done, if only more civil wars and disturbances could be undertaken in such a fun, tongue in cheek manner then surely the world would be a better place. I for one say "Long live Key West!" And certainly "Long live the Conch Republic!"